Professional 3 piece cleaning kit contains all the essential items necessary for the proper maintenance and care of your camera and attachment accessories, including other optics such as; digital camera and camcorder lenses, filters, microscopes, binoculars, telescopes, and more. This amazing kit delivers outstanding performance at a remarkable and affordable price. 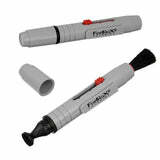 The Fotodiox Lens Cleaning Pen is a great accessory for any optics user, making it great for maintaining your digital or film camera lenses, binoculars, scopes, night vision goggles and other sport optical devices. Safe for use on all optical lenses and compact digital camera lenses. The soft retractable brush and polishing pad removes fingerprints, dust and other debris that may compromise your lens - nothing removes oily fingerprints or dust better. The small, pen-style design easily fits in any camera bag, as the soft natural goat hair brush retracts into pen body to stay clean. The large air blower easily removes dust and debris from cameras, lenses and filters with a powerful blast of air. Made of rubber with a removable plastic nozzle. Includes a one-way valve to prevent Blaster from breathing in dust and spreading it back to your equipment. An air blower is a more economical solution to canned air, easier to operate and more precise than canned air (which has to be held upright, forcing you to hold your devices at awkward angles to clean them). This Squeeze Duster can get into places the canned air can't, and has no toxic chemicals!